While many of our long-term guests are enrolled in drug and alcohol recovery programs, some of them are enrolled in the social services program to connect them with the services they need. I had the opportunity to sit down with one of those guests, Earl, to talk about the circumstances that led him to Bethesda and how his life has changed since coming to the Men’s Mission. Despite the hardships and loss that Earl has experienced, he is a gracious man with a gentle soul. Earl was laid off from his job in 2008 after working for the company for 30 years. At almost the same time his wife told him she wanted a divorce after 30 years of marriage. Following that, he worked for another company for 2 years but was once again laid off. 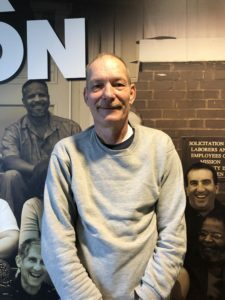 From 2010 to 2018 Earl worked temporary jobs when he could because he couldn’t find a full-time, permanent position. In January 2016 Earl first experienced being homeless after having to sell his house by short sale. At that time his back was injured and he couldn’t work. Earl and his dog, Homer, lived in a tent in a field from mid-January to March 2016. While living in the tent, Earl still had to get his prescriptions and was not getting food stamps. There was a time during those months that he thought he was going to have to give Homer away because he couldn’t afford to feed him. It would have been terrible for Earl to have to get rid of his only form of companionship. Knowing he needed to get his prescription, Earl went to the Walmart down the street to pick it up. 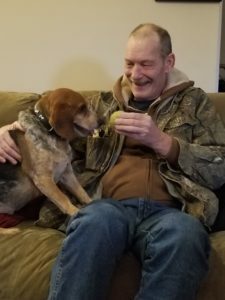 Earl has had his beagle, Homer, for nine years. In March 2016, authorities told him he couldn’t stay in the field anymore because he had previously had a heart attack and emergency vehicles couldn’t get to him in the field. Earl left and stayed with a friend for a couple of months, but the friend had to take his brother in, so Earl and Homer had to leave. Earl had back surgery and was working at Speedway but only getting 30 hours a week. He didn’t have enough money to afford an apartment but had bought a car so he lived in the car. Then the car caught on fire and burned up. He went to stay with a different friend temporarily and just couldn’t find affordable housing. He met a woman through walking his dog who told him that he needed to go to Bethesda Mission. Initially, Earl was hesitant because he knew he wouldn’t be able to bring Homer, but then he found a friend who could take care of Homer. Earl came to the Men’s Mission in August 2018. Earl is now working full-time and saving money to find an apartment for himself with the help of Bethesda staff. When he came to the Mission, he was angry at God because of all the things he had lost. He has a son, a daughter, and five grandkids, but those relationships were strained since Earl’s divorce. His time at the Mission has allowed him to work on repairing those relationships. This past Christmas was the first time in six years that he had the chance to celebrate Christmas with his kids and grandkids. Earl has enough saved to rent an apartment now, so he hopes to move into a place where Homer can come with him. In addition, he would like to attend a church and be involved in the community like he was in the past. He taught Sunday school for 10 years, coached sports for 10 years, and won the President’s Volunteer Service Award in 2007 for 20 years of community service. Update 03/07/2019: Earl was offered a new job that will also provide him with housing. The best part: Homer will be allowed to live there with him! Praise God!